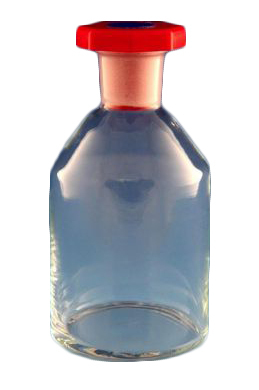 Reagent bottle (100ml) with plastic stopper (photo is of the 250ml bottle). The bottle has a ground glass socket mouth with a red plastic stopper. The bottle is made from soda lime class, not borosilicate, so it should not be heated above 100C or have hot liquid poured into it. Also not suitable for super cold liquids like Nitrogen or dry ice.